This is a Lau Yu Fat house cake. This is their 1st ever 'house cake'. 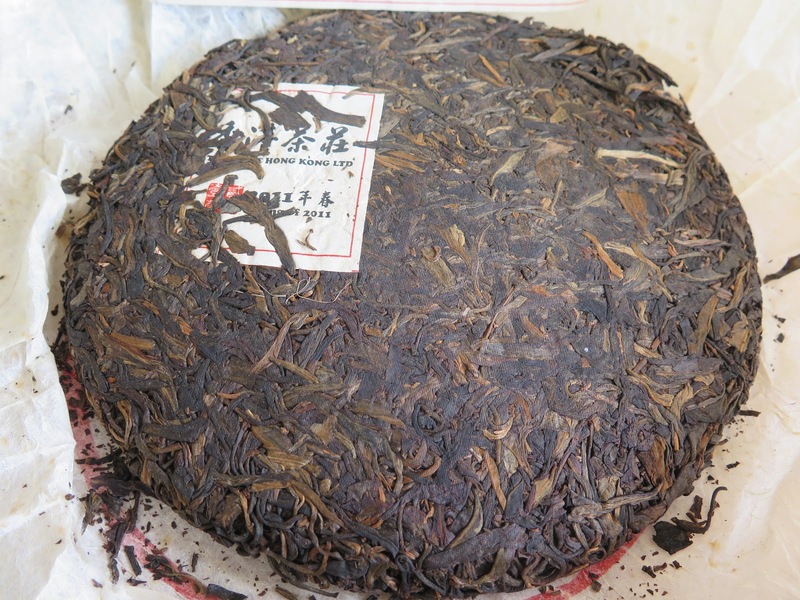 Produced in 2011, this cake is a blend of Bulang and Bada tea leaves. I had been their customer for more than 7 years and I will always pay a visit to the shop whenever I am in Hong Kong. 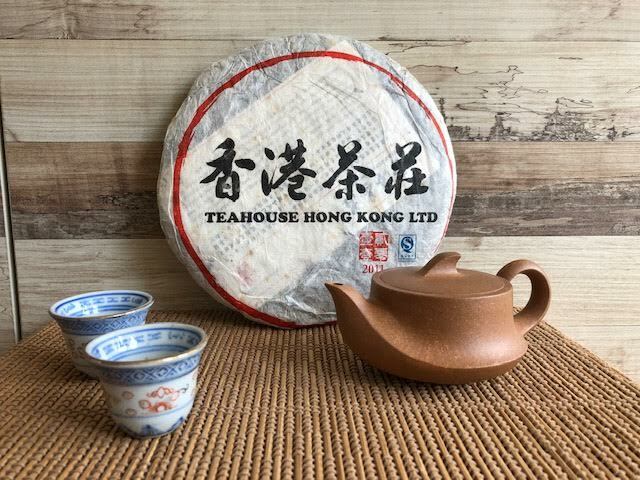 I would also use this opportunity to 'practice' my Chinese Teochew dialect with Senior Lau, who had on many occasions explained to me the history of the Hong Kong tea scene for the past 50 years. This teashop had been around since the 60s and is now managed by the 3rd generation of the Lau family. Back to this tea cake. This cake is strong in both taste a aroma. There is no fresh floral notes or hardly any sweetness.......maybe very very faint sweet hints in the aftertaste. There is good herbal bitterness but the tea is very smooth. I am angry with myself for opening his tea cake. This tea is still 'newish' as evidenced by the harshness of the tea. 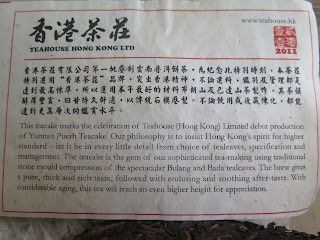 This tea would be very impressive if stored for another 5 years or more. 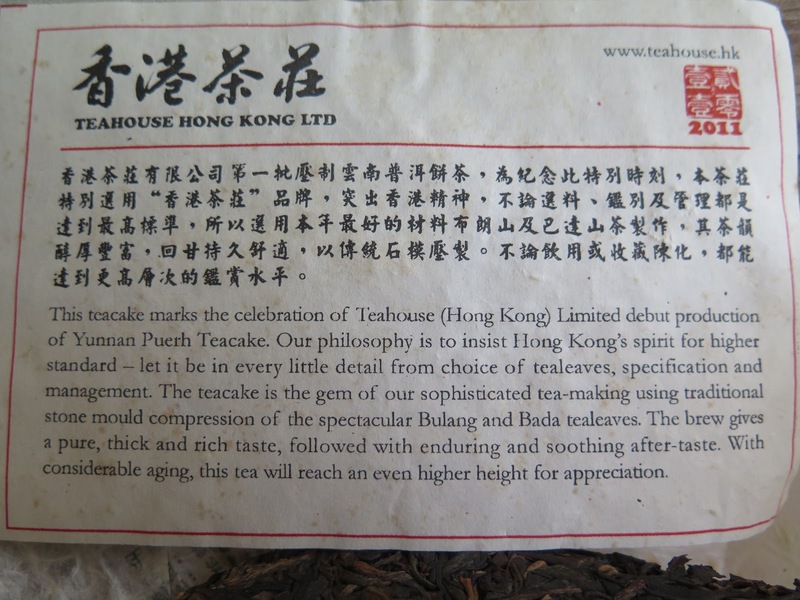 I had already stored this tea for more than 6 years in Singapore. Sigh. I will break the cake in a tea caddy and will open this canister again after a few years. I managed to buy a Ni Xing tea set. No typo. 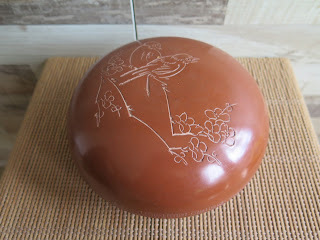 It is Ni Xing clay. This Chinese clay is from the Guangxi region and this clay a popular clay for making ceramics pottery. This clay comes in a spectrum of colours from dark brown to light red. 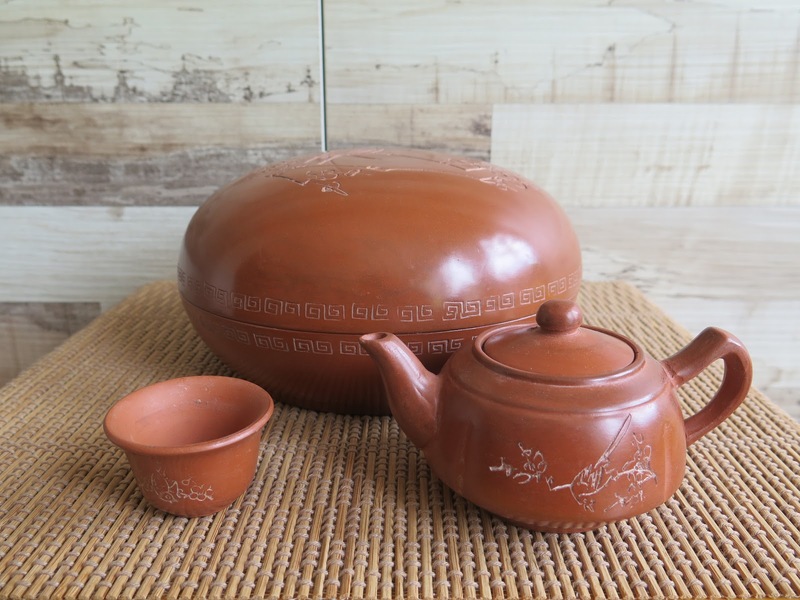 This clay is not so popular or as pricey as the famed Yixing Clay. I guess is that Ni Xing clay looks more muddy in colour so perhaps less appealing to the eye. I do not own any Ni Xing tea ware till now. 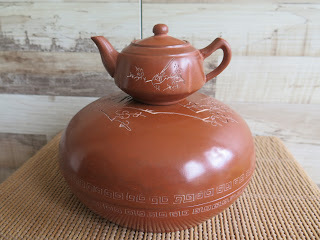 It was my good friend Su from Ipoh that told me to get a Ni Xing tea pot. In her words; "Once you use, you will fall in love. Especially if you brew a lot of old tea. 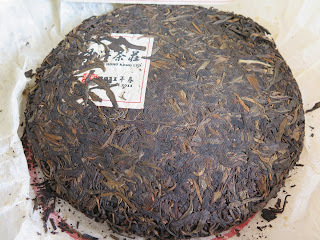 New sheng don't brew up so well but old teas are fantastic, steeped in good well seasoned teapot". 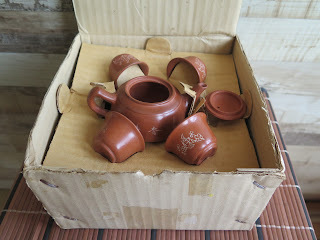 I had been looking for a ni xing teapot for a few months and was over the moon when I saw this unused set. I was told this set was made in the late 90s. Notice the set came with 4 cups and a covered pot / container. 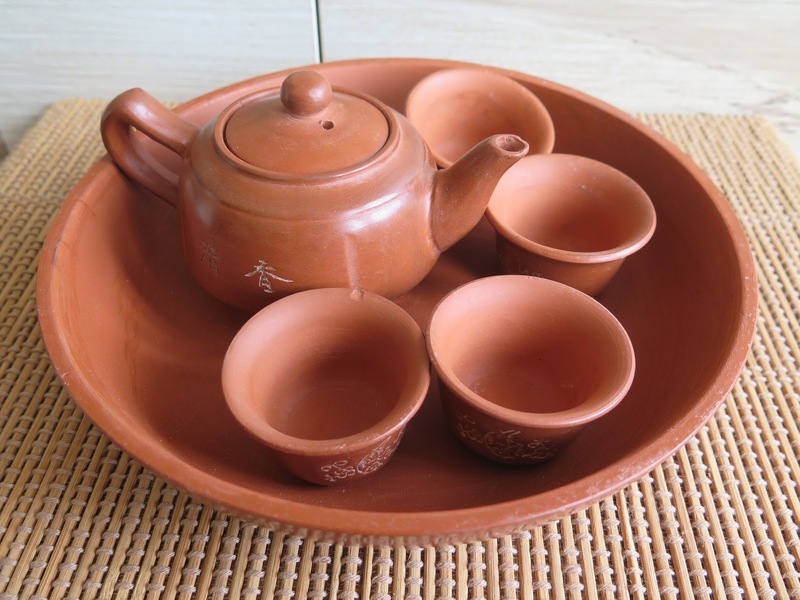 This container could act as a tea tray for tea waste bowl as well. This workmanship appears rough to me but I am not complaining. a) Wash teapot and cups under running water. Place teapot and cups in a large pot of water and low boil for 30 min. When water has cooled, rinse teapot and cups well. b) brew tea in teapot. 5-6 infusions. Do not drink and discard the tea. Wash and air dry the teapot. I look forward to my 1st tea session with this Ni Xing teapot this Christmas holidays.